General Electric boss Jeff Immelt has fired back at Presidential candidate Bernie Sanders with an impassioned defense of his company. "GE has been in business for 124 years, and we've never been a big hit with socialists," Immelt said in a Washington Post Op-Ed published Wednesday. "We create wealth and jobs, instead of just calling for them in speeches," the iconic American company's CEO said. Immelt was responding to Sanders' claim that GE is "destroying the moral fabric" of America by shutting down American factories, shipping jobs to China and Mexico and minimizing its tax bill. "That is greed and that's selfishness. That is lack of respect for people of this country," the Democratic candidate recently told the New York Daily News editorial board. Immelt says Sanders is "missing the point" and that his company is "in the business of building real things and generating real growth." How GE fits into the moral fabric of America is "so plain to me," Immelt says. The GE boss said his company had 125,000 U.S. employees and was committed to taking risks and investing in the future of the country. 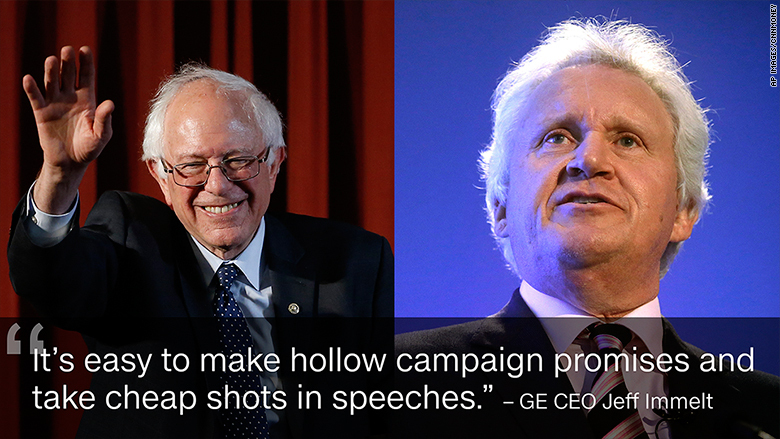 Immelt pointed out that Sanders, the U.S. Senator from Vermont, has never visiting GE's aviation plant in Rutland, VT., which has been churning out jet-engine components since the 1950s. The plant employs more than 1,000 people with high wages. "Vermont's junior senator is always welcome to come by for a tour," Immelt said. Sanders had taken particular issue with GE's shrinking footprint in the U.S.
A CNNMoney analysis of GE's regulatory filings shows that at the end of 2015 just 38% of GE's employees were in the U.S., down from 68% in 1995. 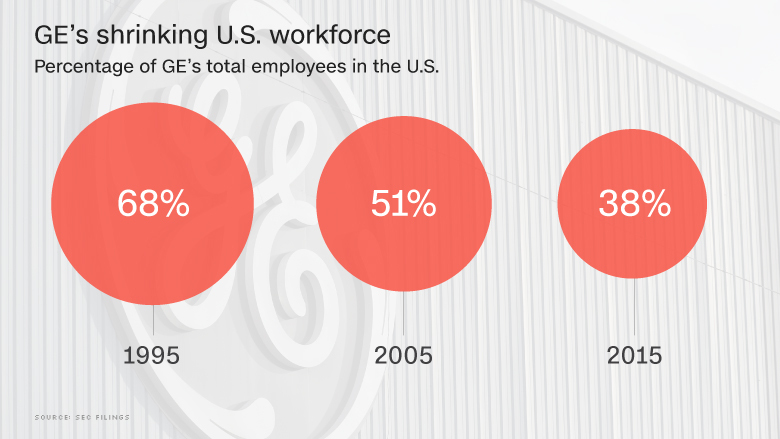 GE also has 10 fewer U.S. plants today than a decade ago, while it has increased its overseas plants by 58. But Immelt defended that as well, noting that GE has customers in more than 180 countries and needs to maintain a presence there. He also pointed out that GE makes tons of stuff in America, exporting over $20 billion worth of goods each year. "It's easy to make hollow campaign promises and take cheap shots in speeches...but U.S. companies have to deliver for their employees, customers and shareholders every day," Immelt said. "GE operates in the real world." Sanders has also knocked GE for being greedy by avoiding taxes, claiming that in a given year the company paid "nothing in taxes." Immelt said Sanders got that wrong too, adding: "repeating a lie over and over does not make it true." GE said it pays billions in taxes and supports comprehensive tax reform, even if that raises the company's tax rate.